Washington (CNN) - Justice Sonia Sotomayor has managed a whirlwind few days, and it promises to get even busier. In fact, a traditional inaugural ceremony was moved up to accommodate her busy schedule. She has a new book released last week, a memoir called "My Beloved World" (Knopf/Random House). To promote it, the 58-year-old justice had arranged several media interviews and book signings. 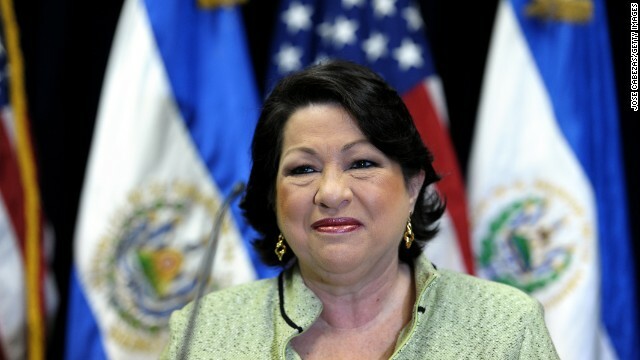 Then came the invitation last month from Vice President Biden to have Sotomayor do his swearing in, for separate ceremonies Sunday and Monday. Watch CNN's comprehensive coverage of President Barack Obama’s second inauguration on CNN TV and follow online at CNN.com or via CNN’s apps for iPhone, iPad and Android. Follow our real-time Inauguration Day live blog at cnn.com/conversation. Need other reasons to watch inauguration coverage on CNN's platforms? Click here for our list. Several friends told CNN they were worried Sotomayor would be pushing herself too hard in these hectic days, but say if anyone can manage the multi-tasking duties, it would be this determined native of the Bronx. They say throughout her life, she has taken her personal and professional responsibilities with a sense of purpose that continues to amaze. Friday, she met in the morning with her eight colleagues in the court's weekly closed door conference, where pending appeals are considered. Four cases were added to the docket, while dozens more were expected to be rejected for review. Later that day she sat down for a cable exclusive interview with CNN in the court's ornate West Conference Room. There she spoke separately with "Starting Point" anchor Soledad O'Brien and CNN en Espanol's Juan Carlos Lopez, about her rich life on the court and growing up in the Bronx. The justice told O'Brien she was not feeling anxious about the inaugural duties, but rather viewing the responsibilities as "surreal." "I was thinking just a couple of days ago, if I think back when I was a kid which of the two would seem more improbable to me I realized each one was so far fetched that I couldn't have imagine either," she said-sitting on the Supreme Court "and swearing in the Vice-President in front of the nation and the world." The justice finished her fascinating, extended discussion with CNN and did another interview that afternoon. Then it was on to a book signing that evening in Washington sponsored by the Politics and Prose bookstore. Saturday brought Sotomayor back up to her native New York City and an afternoon event at El Museo del Barrio in East Harlem. Afterwards, back on a train to the nation's capital. Because January 20, the constitutionally-mandated date of swear-in, falls on a Sunday, the official oaths are being conducted in private. The President will be sworn in officially around noon at the White by Chief Justice John Roberts. Just after 8 a.m. ET, the justice donned her robes to swear in the vice-president at his residence on the Naval Observatory grounds. Inaugural planners and the vice president's office moved the time to accommodate a Sunday scheduling conflict, planned weeks before she received Biden's personal invitation. The moment went off without a hitch, which Sotomayor said was a result of careful planning on her part. "When you read my book, you realize I practice everything I do over and over again," she told CNN. "So I have been saying the oath out loud for a couple of weeks now, a couple of times a day. But I won't be relying on my memory either. I'll have a card with me." Sure enough, the small card with the oath was clearly visible. She repeated he oath and offered a simple "congratulations." Biden said he was honored to have this justice do the honors, officially making him vice president for another term. President Obama nominated Sotomayor to the high court, just months after he took office in 2009. "Madam Justice, these are some of my friends and my family," said Biden to laughter in the crowd, just moments after beginning his second term as the number two. "I want to explain to you what a wonderful and honor it was and how much out of her way the Justice had to go. She is due in New York. She has to leave right now, so I apologize. We're gonna walk out. She, her car's waiting so she can catch a train I hope I haven't caused her to miss." So back to New York, and a scheduled afternoon book signing in Manhattan. Then head down to Washington again. Monday morning, she and all the justices will be escorted from the Supreme Court building, across the street to the U.S. Capitol. There in the historic Old Senate Chamber, where court itself met to hear oral arguments until the 1930s, the court will don their robes and attend the public swearing-in ceremony. The room is different from the main chamber where senators now debate and vote. The justices will be introduced as a group just before noon and take their seats in the front of a specially-built platform on the West Front of the Capitol. There Sotomayor will again administer the oath of office to Biden, ceremonial this time. She is a smart gracious lady who is very much admired for her insight and abilities. A roll model for all. Great a fake Pendent in given the oath by a fake supreme court justest.